[250 Pages Report] The global market for metal powder witnessed rapid growth in 2013, and is projected to grow at a CAGR of 3.80% during the forecast period, that is, from 2015 to 2020, to reach USD 4,062.2 Million by 2020. The Asia-Pacific region is the fastest-growing market with the highest CAGR of 5.01% during the forecast period; this market is driven by increasing competition, consumer awareness, rising consumer spending, demand for powder metallurgy manufactured components, and technological advancements. North America accounted for around 40.4% of the total market share in terms of value, followed by the Europe and Asia-Pacific. The Market for Metal Powder in developing countries such as China and India are estimated to grow at a relatively higher rate from 2015 to 2020. China is estimated to grow faster than any other country because of its strong economic growth along with growing demand from end-user industries and rapid urbanization. 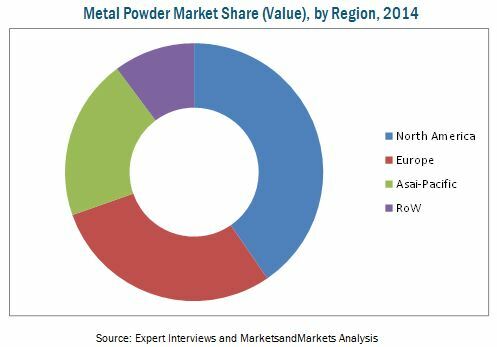 Ferrous metal powder accounted for the largest share of 73.6% of metal powder market in 2014. 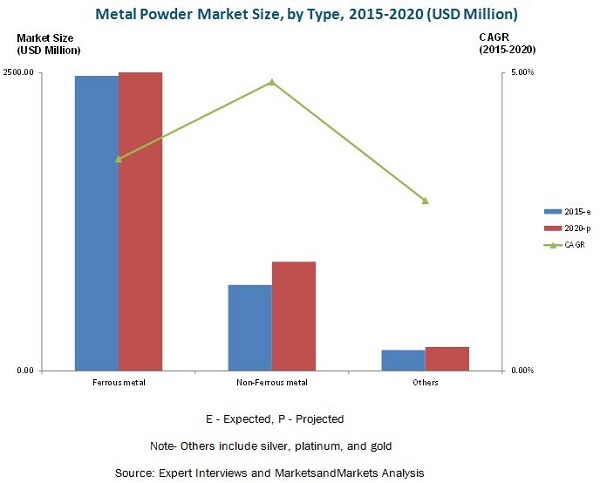 Non-ferrous metal powder is projected to be the fastest-growing segment from 2015 to 2020. Chemical method is projected to be the fastest-growing production segment during the same period. Cold compaction, as a compaction technique, will be the fastest-growing technique from 2015 to 2020. Transportation & logistics accounted for the largest share of the metal powder market in 2014 due to the rising demand for fuel-efficient vehicles. This report estimates the market size of the global metal powder market in terms of value (USD million). In this report, the market is segmented based on metal form, type, production method, compaction technique, application, and region. Market drivers, restraints, challenges, raw materials, and product price trends are discussed in detail. Market share, by participant, for the overall market is also discussed in detail. The global metal powder market has grown exponentially in the last few years and this trend is expected to continue. The metal powder market has varied applications in transportation & logistics, industrial, construction, electrical & electronics, and others. The transportation & logistics segment consumed around 70.8% of the global metal powder market in 2014. The construction segment is expected to grow due to improved lifestyles and increase in the disposable incomes of the population in both developed and developing economies. The electrical & electronics segment is also one of the major end users of metal powder and is expected to witness the highest growth. The increase in demand for powder metallurgy manufactured components has driven the growth of the metal powder market. Growing demand for sustainable products due to the need for reducing the environmental impact of the metal industry has resulted in the increase in the demand for metal powder. The growing preference of metal powder for sustainable and innovative production and manufacturing technologies will also drive this market. Non-ferrous metal powder is expected to grow due to the demand from existing and emerging end-user industries. The market for metal powder is observed to be matured in developing economies such as Europe and North America. The reason behind this is the high disposable income. The Asia-Pacific region is projected to be the fastest-growing market with the highest CAGR of 5.01% during the forecast period. North America accounted for the largest market a share of 40.4% in 2014. The global market for metal powder is projected to grow at a CAGR of 3.80% from 2015 to 2020 and is projected to reach USD 4,062.2 Million by 2020. The metal powder market will be driven by the demand from end-use industries and technological advancements. The development of economies plays an essential role in increasing the demand for metal powder in the global market. The key parameters that determine the growth of metal powder in developing economies are increase in consumption and demand for value-added & sustainable products. The global metal powder market is marked with intense competition due to the presence of a large number of both, big and small firms. Mergers and acquisitions, investments, and expansions are the key strategies adopted by market players to ensure their growth in the market. Companies such as Sandvik AB (Sweden), Carpenter Technology Corporation (U.S.), Hoganas AB (Sweden), GKN Plc. (U.K.), Rio Tinto (U.K.), and Allegheny Technologies Incorporated (U.S.) are some of the prominent companies in the metal powder market. 12.3.8.2.1 Ferrous Metal Powder Dominated the Metal Powder Market in the U.S.
12.3.8.5.1 Growing Demand From Automobile Industry to Drive the Metal Powder Market in the U.S.
14.11 Hitachi Chemicals Co. Ltd.